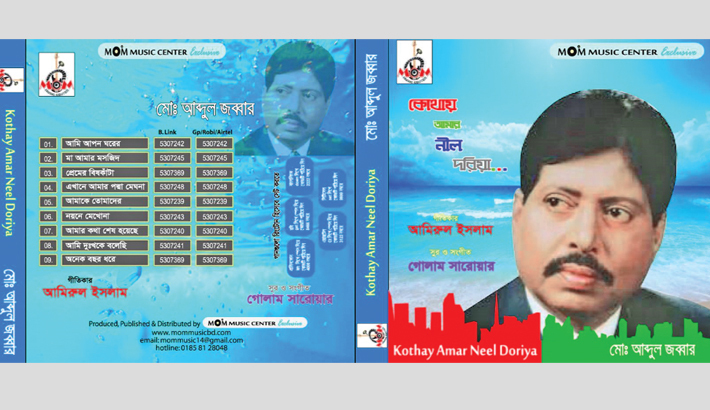 Heart-throb singer Abdul Jabbar’s fundamental musical album “Kothay Amar Neel Doriya” has recently been released online after a long hiatus in his musical work. The album has contained nine songs written by lyricist Md Amirul Islam and composed by Golam Sarwar. The album has been published by Mom Music Centre in the capital. The lyrical songs are ‘Ami Apon Gharer Janlam Na Khabor’, ‘Maa Amar Masjid’, ‘Ekhane Amar Padma Meghna’, ‘Premer Bishkata’, ‘Nayone Mekhona Kajol’, ‘Ami Dukkhoke Bolechi’ etc. “The lyrics are unique and peerless. Mother, soil, country, love, detachment, religion, society and other things lie in this album,” he added. The eminent singer hopes that the album will win people’s hearts at home and abroad. He opines that true music lovers and new artistes will learn much about the versatility of music through the album. For this, the lyricist is deeply indebted to the prominent singer.